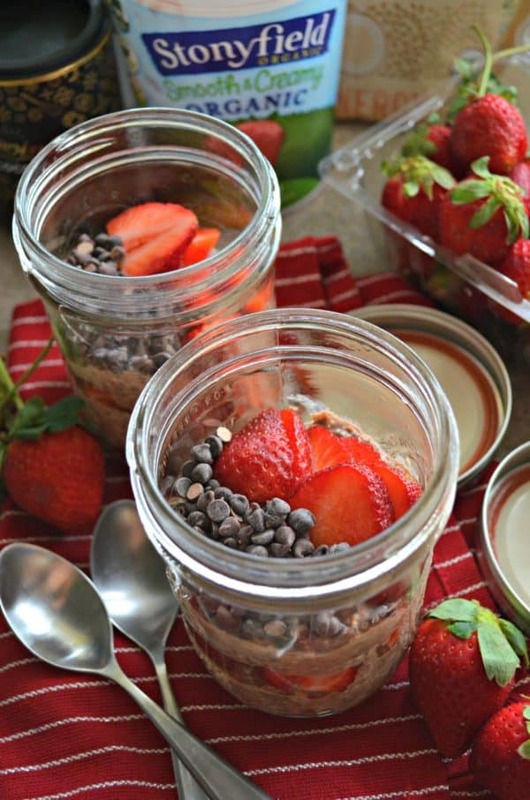 Transform boring overnight oats and make my easy recipe for Chocolate Strawberry Overnight Oats. They are sure to be a new family favorite! I struggle with individual meals for myself. I have no problem cooking a large meal for my family, but when it comes to just feeding myself… I fall flat. I have a feeling I’m not the only one out their that falls short in this department. I’ve started making myself a few jars of overnight oats each week, so that I can grab and go. Well, I typically grab and go sit on the couch while my energetic toddler plays in the morning. 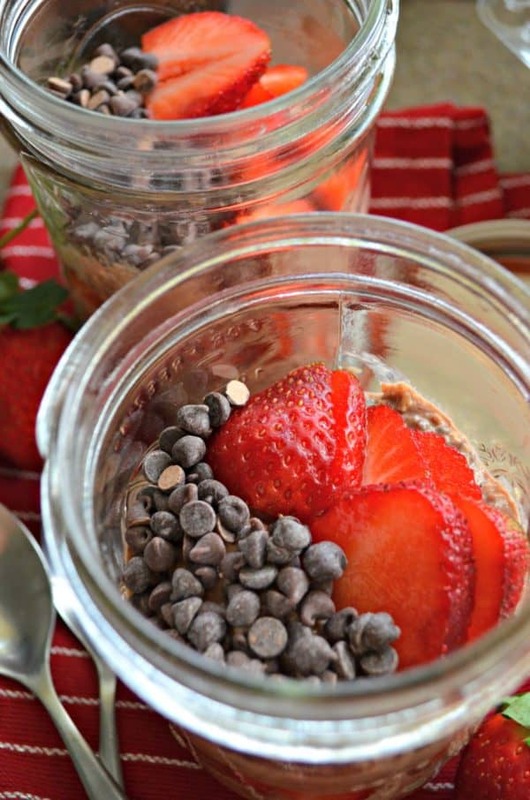 My new go-to favorite overnight oat recipe are these Chocolate Strawberry Overnight Oats. I can actually feel good about eating chocolate for breakfast! And a bonus… the morning my toddler saw me digging in he wanted to try (naturally, because why would I ever be able to just eat my food and not share). He had one bite and exclaimed “mmmm”. I was shocked. I’ve tried to feed him oatmeal multiple times and he has never had any desire to eat oatmeal. But I guess when you add in chocolate and strawberries he was convinced it was good. Of course, I think the mini chocolate chips probably helped too. But in all honesty, he’s been on a strawberry kick lately. I brought him strawberry picking for the first time a few weeks ago and once he learned that he could eat the berries right off the vine he was in heaven! I basically have put strawberries in everything lately and he’s been devouring whatever I put in-front of him. 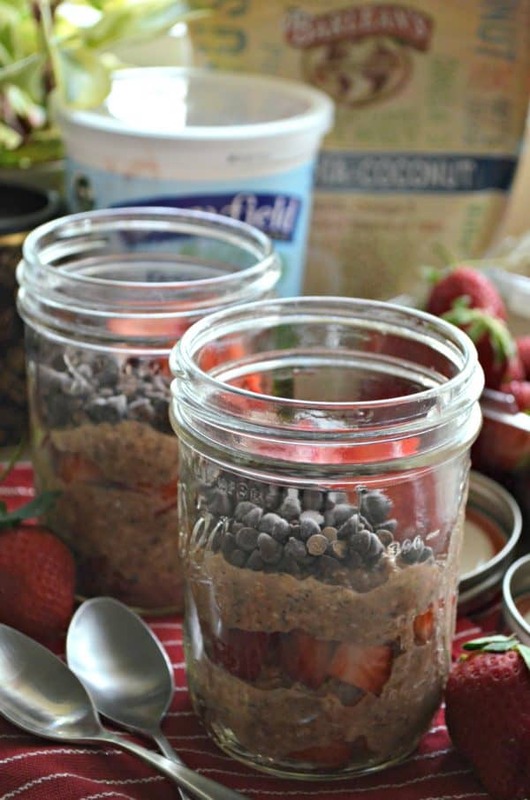 He ate these Chocolate Strawberry Overnight Oats two mornings in a row without any hesitation! That’s a big win in my book. Even if it does have chocolate in the name of the meal it’s just a tiny bit of cocoa powder and a tablespoon of mini chocolate chips mixed throughout one large mason jar! It just has the perfect hint of chocolate and the fresh strawberries add to the sweetness and flavor of the oats. I also mixed in a little bit of Barlean’s Flax, Chia Coconut Blend to add additional nutritional benefits. I used Stonyfield Organic Lowfat Strawberry Yogurt to really intensify the strawberry flavor which worked exactly how I had hoped. I picked up Strawberry honey when we went strawberry picking and added a little bit to sweeten up the oats as well. If you don’t have access to strawberry honey–don’t sweat it. You can use any honey. But the strawberry honey honestly has a hint of strawberry flavoring to it. 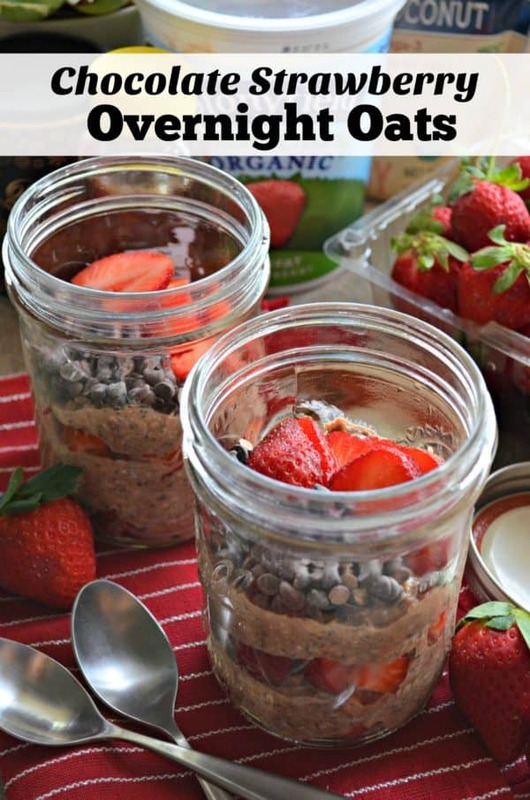 If your looking to switch up your breakfast routine (and want something on the healthier side) I’m going to suggest you give my recipe for Chocolate Strawberry Overnight Oats. In a bowl, mix together the rolled oats, Barlean's Flax, Chia, Coconut Blend, Stonyfield Strawberry yogurt, milk, and honey. Rinse and dice the strawberries. Set to the side. Place a thin layer of strawberries at the bottom of two mason jars. Then layer a few spoonfuls of oatmeal into each glass. Add another layer of fresh strawberries, followed by the remaining oatmeal. Top with additional strawberries and 1 tablespoon of mini chocolate chips per mason jar. Place in refrigerator overnight, and enjoy the next morning. Note: You can use Quick Cooking Oats to consume instantly. Disclaimer: I’m a brand ambassador for Stonyfield Organics. As always, all opinions are my own.